When emperumAn asks “You don’t even have the desire, you want me to mercifully protect you after creating the desire in you – why should I do that?”, ALavandhAr explains the inevitable relationship [between himself and emperumAn]. bhara: asmi hi – am I not to be protected? For the worlds, you are the father; you are the mother; you are the beloved son; you are the good hearted friend; you are the dependable friend (with whom confidential matters can be shared); you are the AchArya (teacher); you are the upAyam (means) (and upEyam (goal)); and I am yours; your slave; your servitor; one who has you alone as the ultimate goal and means; this being the case am I not to be protected by you only? mAthA thvam – Your highness is like the caring mother who carries the child in her womb, goes through the pains of pregnancy and ignores the contamination etc during/after child birth. “pithAmahasya jagatha:” (I am the grandfather for the universe); SrIvishNu sahasranAmam “bhUthAnAm yO’avyaya: pithA” (He who is the imperishable father of all creatures); thiruvAimozhi 3.6.9 “thanjamAgiya thandhai thAy” (the father and mother, who is the refuge). dhayitha thanayasthvam – your highness will help like a very dear son who delivers one from hell. thiruvAimozhi 5.1.8 “nan makkaLum mElAth thAy thandhaiyum avarE” (emperumAn is the dear children, and respectable parents). priya suhruth thvamEva – Your highness is being dear and having the divine heart to always do good [for everyone]. emperumAn is so dear to us that even if he causes disaster, we cannot give him up. Even if he is not being dear towards us, he cannot be given up due to his well-wishing nature. avadhAraNam (exclusivity) [i.e. the usage of “Eva”] is applicable for all words [i.e., he is the only father, only mother and so on]. 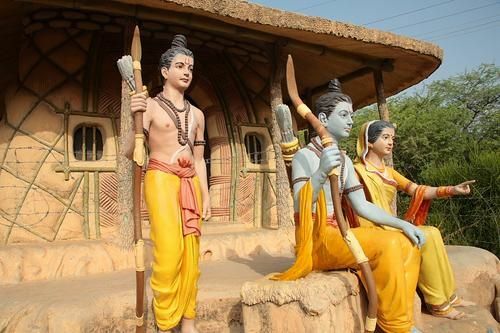 thvam mithram – Your highness who is very trustworthy that you can be informed of all secrets confidently as arjuna won over subadhrA in marriage by informing you ahead of time [arjuna and subadhrA (sister of balarAma and krishNa) wanted to marry each other. balarAma was not favourable towards that idea. arjuna discusses with krishNa, assumes the form of an ascetic and arrives in the town of subadhrA. krishNa tricks balarAma to trust the ascetic, brings the ascetic to their residence and eventually gets him married to subadhrA]. gururasi – Your highness taught by taking up the position of an AchArya as seen in SrI bhagavath gIthA 18.65 “man manA bhava madhbhaktha:” (Place your mind on me, become my devotee) and in SrI bhagavath gIthA 18.66 “mAmEkam SaraNam vraja” (Surrender unto me only). gathiSchAsi – Your highness is the goal and means; Also explained as – your highness is the ultimate goal as explained in “ganthavyathvAth gathi:” (that which is to be attained is called gathi (goal)). jagathAm – These relationships are common for all species of entities such as dhEva (celestial), manushya (human), thiryak (animal) and sthAvara (plant). Also explained as – common for both spiritual and material realms. thvadhIya: – ALavandhAr mercifully explains his special attachment over and above the common relationship with emperumAn. As said in yajur brAhmaNam 3.7 “yasyAsmi na thamantharEmi” (For whomever I am a servitor, I will not leave him and go to anyone else), I am a servitor of your highness. thvath bhruthya: – I am having the relationship with your highness such that I bring about glories for you and sustain myself by doing that. Implies “I am your dependent”. thava parijana: – As said in vishNu thathvam “Athma dhAsyam” (the nature of AthmA being the servitor), I am a natural servitor for you. As said in hArItha smruthi, ISvara samhitha – Siva’s words “dhAsabhUthAs svathas sarvE” (Aren’t all AthmAs naturally servants of paramAthmA?) and SrI rAmAyaNam ayOdhyA kANdam 31.25 lakshmaNa says “aham sarvam karishyAmi” (I will carry out all kainkaryams), I am qualified to do all types of kainkaryams (services) for you. thvath gathi: – I believe that you are the attainable goal. aham prapannaScha – I firmly believe that your highness is the means to attain the goal. Evam sathi – After you being all types of relationships, and I have no other refuge. ahamapi – Even if I spoke/praise without my heart’s involvement. thavaiva bharO’smi – I am fully dependent on your highness only. It means, due to my gyAnam and Sakthi [lack of them] and prApthi [you being the apt attainable goal], my success is your responsibility. That means – you are my controller at all places, at all times, in all situations and states. In the next article we will enjoy the next SlOkam. This entry was posted in Other, sthOthra rathnam on March 11, 2017 by Sarathy Thothathri.